Will your insurance cover you if you’re burgled using keys? Read our guide to find out. Burglaries are not always smash and grab scenarios - instances of burglaries using the householder’s keys are on the rise. But most insurers will not pay out on a burglary claim if there are no signs of forced entry. In 2014, there were more than 6,000 burglaries using keys rather than forced entry. It’s easier than you might think for your house keys to fall into burglars’ hands, especially if you’re among the third of Britons who keep a spare key ‘hidden’ on your property. When you think about it, it seems odd that we would be irresponsible with our house keys, as it holds most of our worldly possessions - perhaps we don’t want to believe that people would disrespect our homes. You might think it’s just common sense to keep a spare key lying around in case of an emergency or if you’re locked out, but unfortunately this can be as good as leaving your door open to criminals - and insurers might see it the same way. Burglars know all the common hiding places - whether yours is under the doormat, in a plant pot, or even hidden under a gnome. They may even watch to see where you leave your key when leaving the house. Keys hidden on your property are not the only ways burglars can enter your house without force. Spare keys given out to your friends, neighbours and people working in your home can easily fall into the wrong hands. 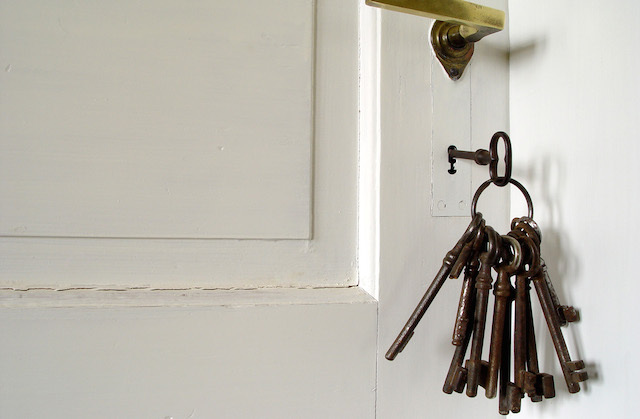 According to Policy Expert, 30% of people leave a spare key with a neighbour in case they get locked out. Remember, by giving your key to a neighbour you’re not only trusting them but also anyone they choose to let into their home where your keys will be kept. Research from insurer LV= has revealed that the average household has lost track of two spare keys, leaving millions unaccounted for.